This post regarding Droids is part of a larger article regarding Wave 4 listbuilding- the rest of the posts in this series will be available in the coming weeks as I'm revealing a post or two per day on the various topics in that larger article. For more info, click the "List Building Resources" tab at the top of the page or simply click here. Card Text: Once per round when defending, if you have a Target Lock on the Attacker, you may spend the Target Lock to choose any or all Attack dice. The Attacker must reroll the chosen dice. Usage: So this is an interesting little card in that it's one of the few truly defensive modifier type upgrades out there. Easiest way to think of this card is it's essentially a reverse Target Lock. If you have the ship attacking you Target Locked, you can make him re-roll his Attack dice. Now, this brings up a couple of interesting points, but they all more or less boil down to when exactly this card text happens, so let's bust out the rules and see if we can get a clear idea of the timing of this sequence. Ah ha! 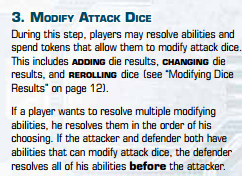 So in the detailed version of the step, we see that if the Attacker and Defender both have means of modifying the Attack dice, the Defender resolves his abilities first. So that's actually pretty significant, right? Main reason I'm under this impression is that tidbit also on page 12 about not being able to re-roll a re-rolled die. The R7 card text explicitly states that you (the defender) are making the attacker re-roll the chosen die/ dice. If that happens, any of the dice that were re-rolled can't be re-rolled again via the attacker's own Target Lock, for example. Now, your opponent can still Focus or Marksmanship or use other Change type die modifications, but he can't re-roll the chosen dice. Note however that if three Attack dice are rolled, we'll call them die 1, die 2, and die 3, and you make him re-roll dies 1 and 2, he could conceivably burn his Target Lock to re-roll die 3. Just saying. So now that we've gotten all that crazy business ironed out, who does R7 work well on? Well, for starters there's only three ships that can sport an Astromech- the X-Wing, the Y-Wing, and the E-Wing, so right off the bat you're rather limited. All three of those ships have Target Lock as a default Action, so we're ok there. Past that, anybody who has an ability that centers around Target Locks or is one of those rare breeds that wants to Target Lock more than Focus would be a pretty obvious candidate, right? Like Dutch Vander for example? Hobbie Klivian might not be bad either, or especially Tarn Mison. Now, that being said, bear in mind this card isn't exactly automatic. Anybody in their right mind isn't going to Attack you if they've been Target Locked by you and you are sporting R7 (I keep wanting to call him L7). Now, that in and of itself can be disruptive which can benefit you as it jacks with your opponents decision making process, but it's a fairly subtle disruption and it's not really even guaranteed to do you much good to have your opponent re-roll those dice. 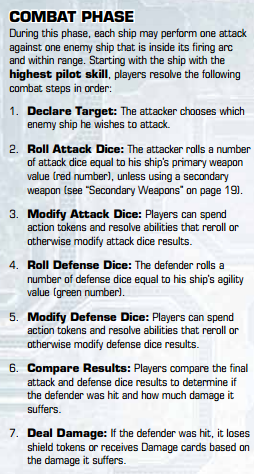 I mean again, recall that the X-Wing Miniatures Attack dice are rigged to hit 50% of the time unmodified. You might throw away a Target Lock and your opponent still hits you. Of course, if he got turbo lucky and scored four crits it might be worth it to attempt to downgrade them to regular hits or whatever, but I would be careful expecting too much out of this card. It has some decent synergy with Sensor Jammer though and makes the E-Wing bearing that combo extremely difficult to hit on top of the ship's already formidable maneuvering ability and 3 Defense dice. Also keep in mind that you do have to discard your Target Lock to get this to work. Since this is a "May" not a "Must" type of thing, you can make that decision contextually, but it's still a bit of a price to pay, though it makes me think on higher PS pilots, it's not such a big deal.